Instead of staying at a standard hotel or bed and breakfast, visitors to the Hudson Valley and Northern New Jersey are choosing more and more to book a short-term rental location through websites like Airbnb — sparking discussions about whether local regulations are needed. Launching in San Francisco in 2007 when the founders rented an air mattress in their apartment, Airbnb now allows visitors to book not only rooms, but entire homes, apartments or cabins, often times for a cheaper price than staying at a hotel for several days. Having more space for less money and the kind of amenities like kitchens and common spaces that most hotels and bed and breakfasts lack a huge plus for families. Travelers can even rent more exotic locations, such as castles, boats, manors, tree houses, tipis, igloos and even private islands. And while most of the locations for rent in the Hudson Valley region are homes and rooms, with a 100 percent year-over-year increase in bookings, the region has become one of Airbnb's hottest destinations. This past fall, there was a record spike in visitors during peak fall foliage season — Sept. 15 through Oct. 14 — with 42,414 guest arrivals in the Hudson Valley and Catskills Region, up from 30,877 guest arrivals this same time last year. Many of the visitors were from New York City or other corners of the state who ventured to enjoy the fall foliage and other autumnal activities. Hosts in the areaWith this influx of visitors, the number of hosts in the area has also increased, along with the amount of money they make. During those same peak foliage weeks, 3,101 hosts in the region welcomed guests and raked in a total of $5.89 million, with the typical host making about $1,352. On the Airbnb site, hosts are in full control of their availability, prices, house rules, and how they interact with guests. The only requirements to become a host — other than basic cleanliness standards and providing essential amenities — are that hosts be responsive, accept most reservation requests, avoid cancelling on guests and receive positive guest reviews. Airbnb covers every booking with $1 million in property damage protection and another $1 million in liability insurance, as well as provides 24/7 global customer support. Locally, the area around Greenwood Lake has seen over 8,000 guests this year since October. In West Milford, N.J., 60 active Airbnb hosts welcomed 4,300 guests, Warwick had 50 hosts and 2,500 guests, and Greenwood Lake had 30 active hosts and 3,800 guests. Hannah Maxwell of Warwick is a Superhost, a designation given by Airbnb to highly rated hosts. Maxwell now has an established guest base, so she has seen visitors return year after year, watched their children grow and maintained an ongoing connection with them that has been incredibly fulfilling. Plus, she said the Airbnb platform is simple and easy to use. The typical Warwick host made $10,400 per year from two to three nights per month. Hosts in West Milford made $10,600 per year, while Greenwood Lake hosts made significantly more for slightly longer stays — $17,600 per year from sharing their home for three to four nights per month. Other destinations in the area this fall included Monroe, N.Y., Sussex N.J. and Newton, N.J.
To regulate, or to not regulateDue to this growing popularity, especially around Greenwood Lake, several towns have enacted regulations for residents who wish to have short-term rental guests. In September, the Warwick town board approved a local law requiring that property owners who rent their properties for less than 30 days at a time to register with the town and pay a $150 initial permit fee. The properties must also be inspected by the building inspector and comply with the town's septic requirements. Owners must carry a minimum of $1 million in liability insurance. Plus, there is an annual $50 renewal fee. Warwick Town Supervisor Michael Sweeton said that the intention of the law is for the town to have a record of where short-term rental units are located, have a contact person on record and to ensure the units are safe and up to code. The law also comes with violations. Property owners who fail to register their property as a short-term rental will pay a $1,000 fine per day, with subsequent offenses are $500 per day. Warwick's regulations came after the Village Greenwood Lake adopted a very similar law last year. And while most of the residents who attended the Warwick public hearings supported short-term rentals under the new law, in nearby West Milford, N.J., some residents seem to be against any rentals in their town all together. 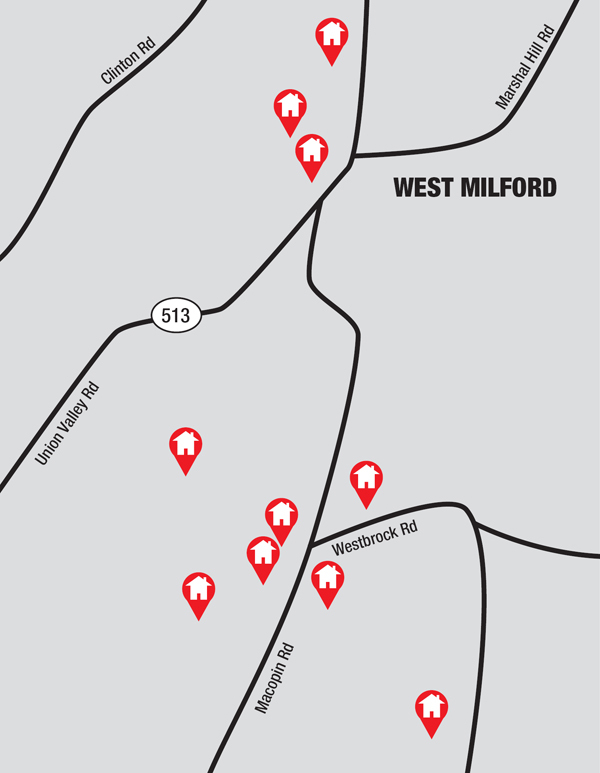 The West Milford town board is considering regulations that would require host homeowners to get a township permit and pay an annual fee, as well as get both fire and health inspections annually, maintain insurance, and provide contact information for a local person who could respond to problems at the property. So far, however, nothing has been agreed upon. Other municipalities in the tri-state area with regulations include Hardyston Township, N.J., which limited the time homeowners can rent out their house to no less than 60 days, excluding a couple of resort communities. Currently, there are no Airbnb listings in Hardyston. Vernon Township, N.J. has also discussed the possible need for regulation. In Dingman Township, Pa., the planning board has discussed whether to allow single rooms to be rented out through Airbnb, a practice that is currently prohibited. “Airbnb recognizes the need for common-sense regulation of home-sharing,” Meltzer said. “That's why we have worked with more than 400 municipalities to craft policy that fits both the needs of local government as well as those of our local hosts — and continue to work with many more. Expecting increase in 2019Looking ahead, Airbnb forecasted some of the top travel trends based off of 2019 booking data so far. Out of all the Airbnb locations around the world, the Hudson Valley and Catskills are the 15th most popular spot for travellers. The increase demonstrates the overall growing popularity of the region, with tourist activities including the hiking trails, ski resorts, vineyards, orchards and farms. Airbnb also said they expect to see an increase in bookings this summer due to the 50th anniversary of Woodstock celebration, which is likely to draw a number of music fans to the area.